All of the opinions on this book are my own. This book was provided to me by Netgalley, Diamond book distributors and Tokyopop in exchange for an honest review. 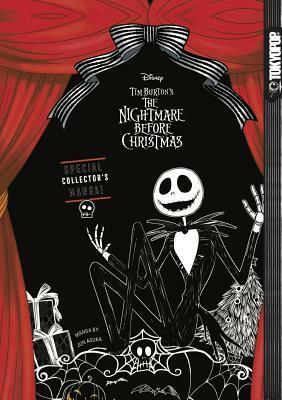 Synopsis: Jack Skellington’s got the blues. He’s sick and tired of his hometown holiday, Halloween, and is longing for something new. But when his soul searching leads to his good-intentioned kidnapping of Santa, things start getting pretty hairy! I requested this manga before halloween and it took me some time to get to it. Finally I did! I absolutely love the movie and thought it would be nice to take that experience with me while reading this manga. I don’t have any experience with manga to begin with, this being my first. I have read a couple of comics and wasn’t always so enthusiastic about them. This manga stayed true to the story of the nightmare before Christmas, which made it relaxed to read through because I would know the path the story would take. This is something that is definitely not guaranteed when you read something that also exists in the form of a movie. I personally like it when a book is similar to the movie, since it makes the story literally come to life for me. On the other side, I would love it more if the movie was more similar to the book, instead of the other way around. It became a little boring because of that. I couldn’t use my imagination that much. Even though the story was clear to me, I can imagine someone who never saw the movie not understanding this manga. On the other side I don’t imagine someone reading this when they haven’t seen the movie. Also the songs in the movie are an important part of the movie. In this mange it wasn’t represented that much, taking a big part of the fun away. I felt like I had to play the songs in my head myself. The art was beautiful. I loved the fact that the drawings were very clear and distinctive to see. It wasn’t unclear what I was looking at. The only improvement I would add is some colour to the art. With a bit of colour it would add some power to the story. I sometimes felt like the book wasn’t finished yet, because it was so plain black and white. Overall I enjoyed reading this manga. It was sometimes else than only watching the movie, seeing the story in book form. I gave this book 3 stars. It wasn’t bad, but it didn’t capture my excitement.